Bespoke printing solutions for any interior design project. Any colour or number of colours can be incorporated into your map. Your logo, mission statement or "You Are Here" arrow can also be added. We can highlight boundaries or mark locations on the map. Full proofs will be sent to you before printing is started. Printed Space has been in business for over seven years. We've worked hard at establishing a reputation for quality and delivery in both the business and home markets. We're proud of our client list which is expanding by the week: Specsavers, Toyota, Forbo Flooring, Irregular Choice, Thomas Pink, Universal Studios, Sony Music, Mastercard, Jet 2, Pizza Express, Hamleys Toy Store, McDonalds, Virgin Media, Geographers A-Z Map Company, Alton Towers Hotel, English Heritage, Drivers Jonas. Our clients, home and business, come to us from all around the world: Europe, Scandinavia, Australia, New Zealand, USA, Canada, Cayman Islands, Bahrain, UAE, India, Pakistan. We are proud of our research and development department. Our latest product is a global first: Floorink, high resolution digital flooring for commercial and domestic use. We are continually reviewing, up-dating and refining all of our products. The Printed Space image database, launched August 2009, includes partnerships with hundreds of artists, designers, printmakers, photographers and illustrators across the world working up bespoke ideas for our Wallpapers ( wipe clean, linen finish, magnetic, laminated crystal finish, smooth, eco, classic), roller blinds, canvas art, flooring, banners, vinyl, garden art and fine art paper. If you have Canvas Artwork or Modern Art Paintings and would like to mass produce them to maximise sales please contact us and we can turn your artwork into affordable art and reach a wider audience. Browse our website to see our unique range of retro style, contemporary, abstract, modern, pop art, icons, urban life, landscapes, celebrity. If you are wanting a canvas to blend in with your room colour scheme, we can produce all our Canvas Prints in any desired colour e.g. Black, Dark, White, Orange, Blue, Red, Green, Pink, or Brown. Canvas Art can transform any room in your house or office and our unique wall art will make your stand out from the rest. All our frames are custom made ( tailor made ) Even if you require a large canvas print or a supersize canvas we can tailor make a canvas to fit your required space. We can produce canvas prints and wallpaper murals of World Maps, Town Maps, City Maps, Road Maps, Street Maps, Maps of Counties, Ordinance Survey Maps, or they can be themed such as Pirate Paper, Seascape, Ballet, Stars, World or even on Love. 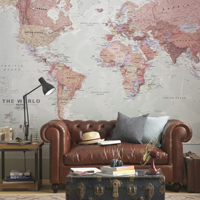 Your luxury wallpaper can be themed around a Girls Room or Boys Room Maps of countries e.g. Great Britain, USA, Canada, Europe, Germany, Italy, Australia, New Zealand, Africa, Holland, Sweden, Holland, Japan Our Bespoke designer wallpaper is ideal for all Interior Rooms, Lounge, Bedroom, Children's Rooms, Nursery, Office, your feature wall, feature wallpaper, feature wall mural. It is extremely durable and can be used in Kitchens and Bathrooms and for high traffic areas can be laminated for added protection. Your pictures, prints, images, photo or photo’s can be printed onto vinyl cushion flooring and to floors ( Flors ), Cushion Floor, (Flor) Vinyl Cushion Floor ( Flor ) Resilient Flooring ( Floring ), Contract Flooring (Flor ), Linoleum ( Lino) or Carpet, All our floorink can be produced on Safety Floor Luxury Vinyl Tiles And is ideal for Hospital Floors, Gymnasium Floors, Office Floors, Swimming Pool Floors, Factory Floors, Shop and Office Floors.